The Requirements were ISSUED effective in 2012. 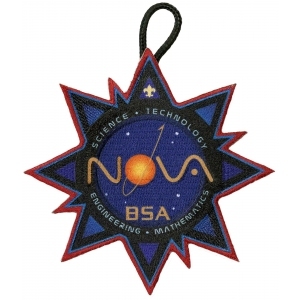 The list of merit badges approved for use in earning the Supernova awards was REVISED in 2015. First-Level Supernova Award for Scouts BSA. Complete TWO Supernova activity topics. one each in two different STEM areas. A Supernova activity topic is a two-part, hands-on, high-level activity related to one of the STEM fields. Part 1 involves research, preparation, set up, coordination, and/or organization. Part 2 involves analysis and reflection, culminating in the creation of a report in any one of the available format options. See the "Supernova Activity Topics" chapter. Working with your mentor, organize and present a Nova award or other STEM-related program to a Cub Scout den or pack meeting. Be sure to receive approval from the appropriate unit leader and agree on a time and place for the presentation. If a Cub Scout den or pack is not available, your presentation may be given to another youth group, such as your troop or at your place of worship. Review the scientific method (you may know this as the scientific process) and note how scientists establish hypotheses, theories, and laws. such as legal, cultural, religious, military, mathematical, or social environments. and your conclusions about how the scientific method can or cannot contribute to the resolution of the controversy. See the "Supernova Activity Topics" chapter for more information about activity topics.